TOKYO, Nov. 15 ― On November 14, 2018, the Dairy Farmers’ Political Federation of Japan (Nihon Rakuno Seiji Renmei) gathered at the LDP headquarters in Nagata-cho, Chiyoda ward, Tokyo, to announce the launch of the initiatives for maintaining and developing small- and medium-sized businesses-most of them run by families-that are responsible for the majority of production of milk in Japan. Their ultimate goal to make a breakthrough for dairy farmers, many of which are close to being out of business. Approximately 700 farmers attended the meeting and explained the difficulties and the support they need to the diet members of the ruling party. The federation authorized the resolutions seeking political supports in stabilizing their businesses and strengthening their production infrastructure, including an increase in milk price and expanded measures against natural disasters. The resolutions focus on five agendas including appropriate milk price to motivate current and new farmers, continued/expanded measures against frequent natural disasters including off-grid power systems and anti-heat facilities, and continued/expanded supports to domestic farmers facing the expansion of free trade. 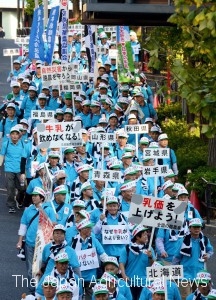 After the meeting, the farmers marched on the street from the LDP building to the Hibiya Park in Chiyoda ward. 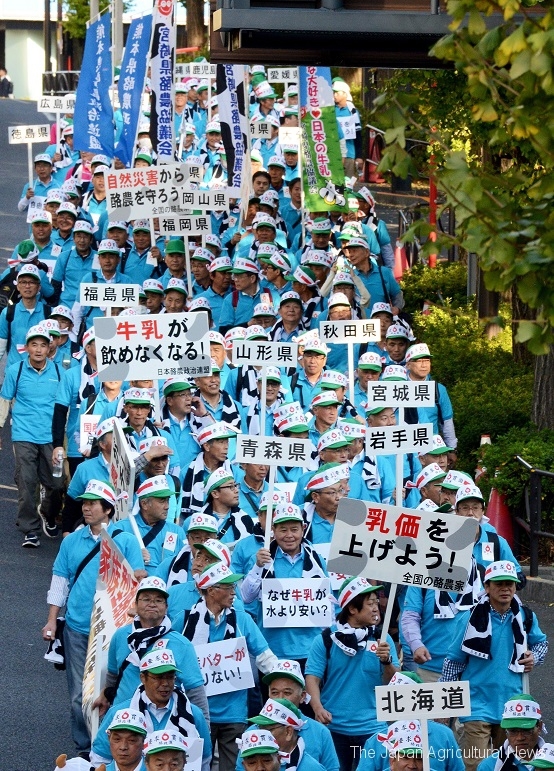 “Increase milk price to maintain domestic dairy farming,” they called on the streets.